Center Stage is a monthly feature hosted by Ginger-Read Reviews, in which we highlight a character from the books we've read in the past month. 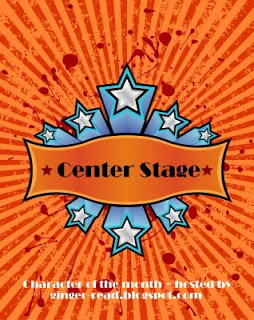 I was so excited to see that Ali had started this feature because I love raving (and sometimes ranting) about literary characters! And now I have a legitimate excuse to do so! 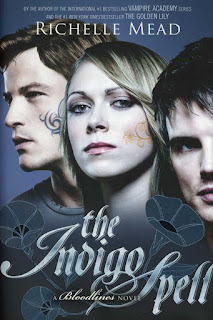 Richelle Mead's The Indigo Spell was one of my most anticipated reads of this year, due in large part to Mr. Adrian Ivashkov. I confess to not immediately falling for his charms way back when he made his first appearance in the second Vampire Academy book, Frostbite. But Adrian is a persistent fellow, and it wasn't long until I was swooning over him, too. I love Adrian for his endless supply of snarky comments and how he lives in the moment. Yes, he possesses a pretty healthy ego, but underneath the swagger is a kind, generous heart. Adrian will do anything for the people he cares about. "We looked up and found Adrian standing above us, dashing in his shades of blue. His face was the picture of perfect politeness and restraint, meaning something disastrous was probably about to happen." I love this boy too, though I have to say it's been far too long since I've had a good dose of Ivashkov! I have this book on my kindle and I'm thinking I need to push it a little closer to the top of my tbr! Great choice this month girlies! Aren't you just loving this meme! Clever girl that Ali, I think it's going to be huge! I love this meme, too! You should definitely move The Indigo Spell up on your TBR list- it was fantastic! I have not gotten to him yet :( Boo Me!! He sounds wonderful though. He's definitely one-of-a-kind! I was ecstatic when I found out that he was in this series! It's hard for me to believe that I didn't really like him at first. What was I thinking?! I can't wait to see what you think of him in both Vampire Academy and Bloodlines! I have to confess, I'm a vampireist. I discriminate against vampires in literature. Maybe real life too. Adrian sounds like such a fun character, but then I remember the V word and think, nope not interested. I knew I wasn't going out of my way to read vampire novels, but I didn't think I was this averse to them. My shameful discrimination aside, if he was a human, I think I'd love his character. It's perfectly OK if you don't like vampires! I think there was a general vampire fatigue thanks to the glut of vampire novels that followed Twilight. For whatever reason, I've never been all that interested in werewolf books. I'll read about them if they're in a book with other paranormal creatures, but I've never read any books in which they alone are featured. Adrian is one of my faves, too! He's so funny but he's also become really honest about his feelings which is really refreshing! He was so incredibly sweet in The Indigo Spell! I can't wait to read from his POV in the next book!